A thali platter at Pappe. All photographs by Scott Suchman. 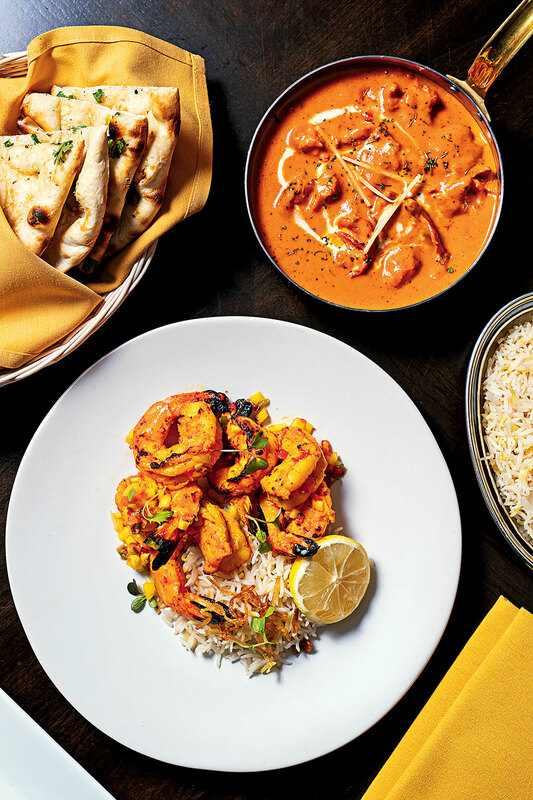 When Americans hear “neighborhood Indian restaurant,” they might think of good takeout tikka. But in the hands of New Delhi and Mumbai natives, the concept means something entirely different: a cozy, silk-draped haven where spices are roasted whole, kebabs are cooked over an open flame, and welcoming bartenders pour cardamom gimlets. Friend-chef/owners Sanjay Mandhaiya and Shankar Puthran bonded over a love of real-deal vindaloo—the kind, as Pappe’s website puts it, that “ought to come with a fire extinguisher.” Order the vinegary curry hot and you’ll need a rosemary-flecked naan—or, better, a round of it—to temper the singe. That said, the kitchen can deftly tailor heat levels to each order. Lunchtime thali platters ($14 to $20 a person) with ten-odd items are some of the most generous deals in town. And classics such as butter chicken or ginger-laced yellow alare just as good as innovations like Goan crabcakes in buttery pav buns or branzino swaddled in a banana leaf. 1317 14th St., NW; 202-888-8220. Moderate. Spiced potato patties at Bombay Street Food. Asad Sheikh went from Dunkin’ Donuts franchise owner to one of Northern Virginia’s top Indian restaurateurs. But he’s since sold his suburban places—London Curry House, 1947, and Curry Mantra—to focus on this Columbia Heights restaurant. The colorful dining room highlights street foods the Mumbai native grew up eating, and he doesn’t shy away from spice. You’ll be reaching for your mango lassi after a few bites of Indo-Chinese cauliflower. Sheikh also wants to introduce diners to dishes beyond tikka masala. Number one on our hit list is vada pav, with a mashed-and-fried potato patty dressed in cilantro, tamarind, and hot-garlic chutneys, all set on a pillowy bun. Beyond the snacks, the menu features many curries and tandoor dishes. The showstopper is a super-sized thali meant for two. The sampler takes up the table with six curries, tandoori chicken, yogurt raita, mango chutney, house-made salty mango pickles, naan, and gulab jamun (syrupy doughnut holes) for dessert. The menu labels it a “must-try” for good reason. 1413 Park Rd., NW; 202-758-2415. Inexpensive. This Cameron Station dining room was recently taken over by a group including Dip Raj Magar, owner of Alexandria’s esteemed Royal Nepal. Though he’s kept the fireball-red walls and chandeliers, the menu has been overhauled. At Royal Nepal, Magar is known for head-turning presentations. Maybe that’s why here, a puffed-rice salad spills out of a cornucopia-shaped pappadam. A tender lamb-and-lentil-patty appetizer is less flashy but more memorable, thanks to hits of roasted-tomato sauce and balsamic. While a sturdy kale version of palak chaat is flavorful enough, it might leave you missing the famed fried-spinach snack at DC’s Rasika. Still, many of the curries shine: a tangy butter chicken, fiery hunks of on-the-bone goat, or baked eggplant with peanut-sesame gravy. And you can always count on the momo—dumplings filled with bison or chicken—a crossover from Royal Nepal. 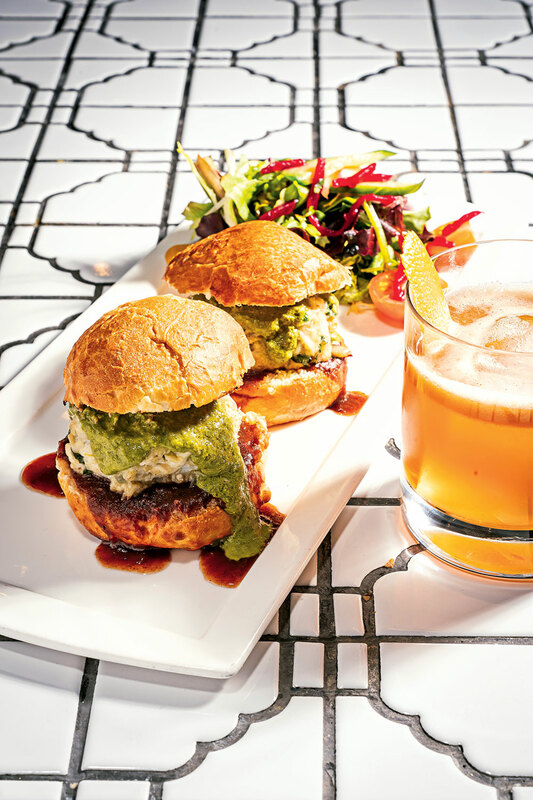 Magar, a former Blue Duck Tavern staffer, has spiffed up the cocktail menu. His smart creations are worth passing up a lassi for. 4906 Brenman Park Dr., Alexandria; 703-419-3160. Moderate. Mango shrimp and butter chicken at London Curry House.